Cozy, private, semi secluded home in Frenchman's Bay atop Hawk Hill offering gorgeous 180-degree ocean view, views of cruise ships coming and going, view of St. Croix on a clear day. Quiet, and away from hustle and bustle of Charlotte Amalie yet short ride for shopping such as Havensight, Yacht Haven Grande and dining. Popular restaurants includes Iggy's Bar, Delly Deck, Hooters and Greenhouse. Spacious balcony overlooking ocean view spans south side of house with French doors off living room, master bedroom and dining area. 2 bedrooms comfortably accommodates 2 couples with sleeper sofa for 1-2 additional guests in living room. Each bedroom has its own private bath. Ceiling fans in every room. Air conditioning. Limited wi-fi available. Ask owner for details. I recommend this property. We shared this house with another couple and found it comfortable, clean, and well-maintained. There is a gorgeous view (as you expect from the description in VRBO). Best of all, the owner is very responsive and easy to work with. Basics: Good floor plan. Nice bathrooms . Plenty of linens, bath towels and washcloths, and beach towels. New grille and deck furniture. Lots of dishes, bowls, cups, and glasses. Four beach chairs provided. The best thing is the beautiful view, but be aware, the house provides that view because it is located WAY up a windy, narrow road. Since we are very familiar with St. Thomas roads, it was not a problem for us. We really enjoyed our stay here and recommend for others! this place is perfect, especially for two couples traveling together as it has two bedrooms, each with their own private bath. The view from the balcony is breathtaking, and there's lots of privacy. There was a little bit of road noise at night, and neighbors were up early, but didn't bother us much. The island breeze is enough to keep the place cool and I especially loved that the balcony doors completely opened up with screens. The kitchen was fully equipped with dishes, so we were able to make our own meals, and living room was comfortable although we were disappointed to not find a deck of cards anywhere. We ended up buying some so we could play out on the balcony after our jam packed days. The place was also very centrally located, which was awesome. About 20 minute drive in each direction to the farthest points of the island so we were able to explore everything. You will not be sorry you rented this place! Love the gate, the deck, the bathrooms and the bedrooms and the layout of the living space. Every time I rent a home in St. Thomas I miss my comfortable furniture in the living room and Hawk Hill was no exception. Maybe owners feel guests aren't in need of this feature but after a day of hiking, swimming, drinking and riding in the rental jeep up and down bumpy roads, I need an upholstered resting spot. While the two bedrooms were very comfortable, no one in my family could sleep on the sofa bed, it caused back spasms. Overall, I would recommend Hawk Hill for a family of four, it was well supplied and offered plenty of space for a fun vacation. My son is a bartender at Havana Blue and it was a quick ride for the best drinks and food on the island. We also love Abi Beach and Hawk Hill was minutes away. Thank you for a great vacation at Christmas, no air conditioning needed, the breeze was amazing! Review much appreciated. Comment regarding the sofa bed was very helpful as I had replaced the old uncomfortable inner springs mattress with memory foam mattress. Unfortunately, sofa beds in general are not as comfortable as a real bed. The sofa bed mentioned had a covered plywood to support the cushions, which also could be used to provide additional support under the mattress. There is also extra plywood in the house for added support. Owner will be sure to provide full disclosure to future guests regarding the sofa bed. Thank you. We enjoyed our stay in St. Thomas and our " retreat on top of the mountain". The cottage was clean and well maintained. Any problems were dealt with immediately. There was plenty of cooking supplies, towels, sheets, etc. The washing machine and dryer were a bonus. We enjoyed the porch over looking the bay, and watched the cruise lines and cargo boats come in each day and leave at night. I wished there'd been a telescope so we could see the names of the ships as they sailed by us. We went to the Puelbo supermarket for our food supplies. It was were the locals go, and is off the mountain and near downtown. The customers and cashiers were very accommodating and willing to guide us in finding items. Everyone on the island was willing to help the "tourist". We found the beach at Corky to be the best place to snorkel. They have chairs (for rent), food, and a great beach! Servers even come out to the beach to sell drinks and food. Many offer free drink "tastes". We went so many times that we learned every ones name and, of course, got better service. Red Hook is an area where you get the ferry over to St. John and has a lot of eating and tourist attractions. Tuto is another area where the Walgreens and K-Mart are. Driving on the "wrong" side of the road was a little strange and took concentration! You could always use the "taxis". Iggies is a restaurant near our Mountain Retreat, right on the water offering drinks and good food. 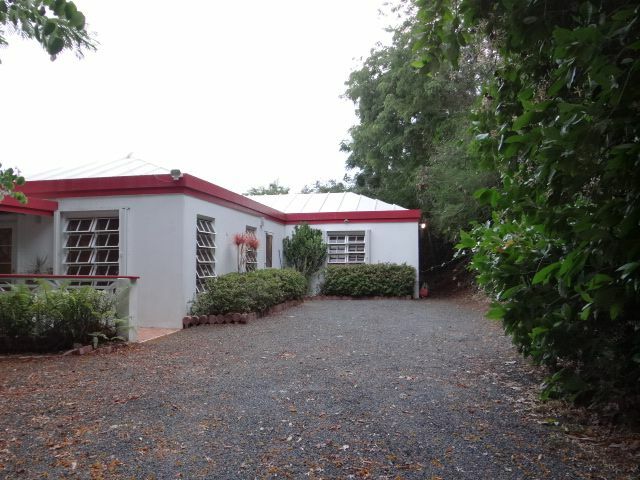 Go spend some time on St. Thomas and at the "Mountain Retreat", you will love it! We were pleased with the house. Nice kitchen, living room, bedrooms, bathrooms. Very nice view. It is quiet there. You are a few miles away from Red Hook and Charlotte Amalie, but it feels like much further. Everything was working except the washing machine. Steep drive up the hill, but it is less than 1 mile. Be sure to get the coordinates of the house in a GPS. This is the way to experience St. Thomas. We rented for the month of January 2016 at a most affordable rate and plan to do so again in the future. The home is very well maintained, very private and high up on the side of a big hill with panoramic views from the deck across the entire back of the house. There are two large French doors to the deck and we kept them open the entire time. The A/C was never needed since the many ceiling fans kept the air moving nicely. There is a flowering tree at the end of the deck with regular hummingbird visits. We woke up to the songs of various birds every morning as the sun came up. This is an ideal winter getaway. Perfect weather every day. Ocean temperature 80 degrees. Beautiful beaches. Great snorkeling. We strongly recommend renting a day on Joma's 46' sailboat for a tour of nearby islands like St. John and the British Virgins. House is located 10 -15 minutes from town where shopping and tours are available, Nearby hotels include Bolongo Bay and Bluebeards with ongoing activities. Popular beaches 10-20 minutes drive. Nearby beaches are Limetree beach (Bluebeard's), Bolongo beach, Abdi beach, and Morningstar beach. A car is necessary. Children 11 years and older welcome. Reservation dates will be confirmed upon receipt of reservation deposit after receiving signed copy of rental agreement. Damage Protection insurance is highly recommended. Refundable deposit applies to incidentals not covered by insurance. If insurance not desired, a significantly higher deposit will be required. Details within rental agreement and upon booking. Monthly stays possible up to maximum of 3 months. Contact owner for available dates.